When most people hear the word shed, they usually picture a humble garden shed whose only purpose is to serve as a storage space for garden tools. It doesn’t exactly conjure up images of a place in which you would love to spend your quality time. But this isn’t all that a shed can do. With the right interior and exterior decorations, a shed can easily transform into an extension of your living space. They can become game rooms, summer houses, office spaces, she-sheds and much more. The possibilities are limitless. In case you still don’t own a shed I encourage you to build one with these free shed plans. I have compiled a list of some makeover ideas that will hopefully inspire you to transform an ordinary shed into your intimately personalized space. Perhaps you are looking to create a place where your family can hang out. Maybe you want a place where you can just curl up and get lost in a book. Whatever the case, you can never go wrong with these fantastic ideas. 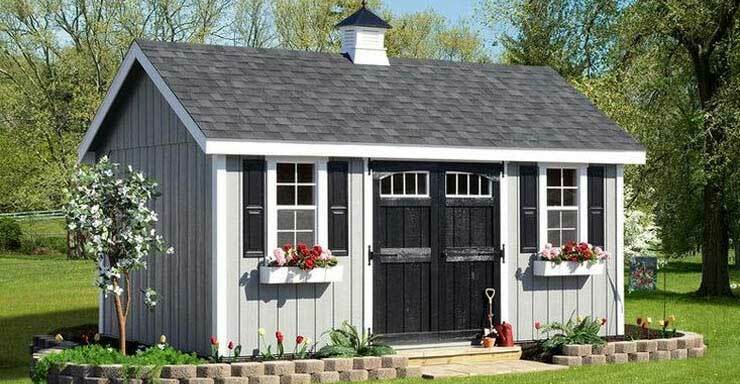 Sometimes all your shed is missing is a coat of paint to give it that sparkling look. A fresh coat of paint will give it a new life. I would recommend white, which is a classic color of choice. But whichever color you pick, make sure that it not only looks good but also defines who you are. For the ladies, you can take this opportunity to transform what would be an ordinary shed into a proper she-shed. You can choose pink, light yellow, light blue or a feminine shade of purple. Men don’t have to use bright colors for the entire shed. You can paint bright and happy colors on the door to make the shed look inviting. If you’re hoping to use the shed as a place to entertain your friends, you need to make the place look inviting. It means that the exterior needs to look great. You can decorate it using lanterns, string lights, and romantic outdoor curtains. A stone pathway leading to your shed will not only look good but will make it easier to move things in and out. A wide entry door will also impart elegance and create a welcoming approach. You can install side lights to accentuate the look. Plants and flowers will also give your shed some personality. There’s also this trick I picked up from a friend of mine: You can hang some of the old and rusty tools as decorative since they are of no use to you anyway. The windows can also have a significant impact on the look of your shed. Gothic arched or arched top windows may still look beautiful by themselves. But your regular windows, even the fake ones, can still look good if you added in some window boxes filled with flowers, plants or herbs. You can turn a boring shed into a pub, a place where you can hang out with friends and have fun. You will need some bar stools, lights, a fridge and, well, drinks. Go with something big and elaborate, or keep it small and simple! Spice up the look by giving the bar a name, and installing retro bar signs. Neon signs will make the place look awesome and authentic. You can bring in some extra entertainment by including a dartboard, which will not take up much of your space. A curtain may seem like an unimportant thing, but it can significantly contribute to the look and feel of your shed. Not all curtain types will work for you. Choose the right color and pattern that complements the interior’s design and color palette. To shed more light on the room, opt for a light fabric and light color. Go for bold design by choosing bold graphics and monochrome stripes. Curtains can also be an excellent way to create some privacy. One great way to create warmth and give character to your shed is to decorate the walls. There’s no limit to what you can do. You can paint them a color of your choice, or you can decorate them with art pieces, posters or collectibles. You can cover the walls with stones or recycled wood pallets. Textured and patterned wallpapers will jazz up any space and give your shed a complete makeover. You can build shelves to create space for other decorative items and other memorabilia. Every room has its focal point. It could be a simple thing like a wall painting or a coffee table. It can also be something as striking as an awesome car. If you think your ride is cool enough to showcase, you can make it the center of attention by building everything else around it. If that seems a bit much, you can annex it with glass walls where guests can see it from adjacent rooms. I should take this opportunity to talk about car themed decors. They are pretty common. You can use a piece of your old car as a part of the décor, e.g. front grill. You can also use car parts to create a desk, table or something different. Decorating outside the shed is also as important as decorating the interior. Landscaping is, therefore, essential. You can build a vegetable garden around the shed. It will not only provide for some interesting landscaping but will also prove useful to your kitchen. Surround your shed with grassy plants, window boxes of flowers and vine. It will create calm and tranquility. If you hope to create a hideaway, climbing vines will be perfect for creating that”secret” vibe. Bring the nature inside, too, by using plants, plush pillows and fleshly picked flower arrangements as decorations. Decorating your shed does not need to be an expensive affair. If you can find ways of making the place feel warm and cozy without spending a dime, it is even better. That’s why visiting flea markets and antique shops is such a great idea. You never know what you unique item you might find. You can also turn an otherwise useless item into something useful. For example, I turned a very old simple ladder into a useful storage space for the beautiful vases of flowers that I had picked from my yard. It looked absolutely beautiful but didn’t cost me a thing, testament that a little creativity can get you very far. A recycled car tire can become a coffee table. You also can make bar tools out of old beer barrels. Use vinyl tile to dress up your floor. Vinyl flooring comes in a wide range of colors so you can pick one that you like. Various designs replicate wood, stones, and other natural material. Vinyl looks very appealing, but it will also protect your floor from damage caused by water. To keep the shed dry, you should provide enough ventilation in the shed by keeping the underside completely open. Keep the moisture away by covering the top with large leaves and gutters to ensure that the water drains to the ground. Having plants around your shed adds to the beauty, but you can take things up a notch hire by covering your entire shed with green leaves. The idea screams crazy and fun in the same breath. Covering the whole shed with leaves will make it look like a bird hide. This idea will marry well with the concept of creating a hideaway spot, a place where you can sit back and shut the world out. If this sounds like something you could do. By all means, go for it. If you still intend to use the shed as a storage area for your garden tools, you can avoid the clutter and keep things well organized using pegboard walls, racks, and cabinets. You must first identify what you need and what you don’t. For example, there’s no need of having duplicate tools when space is clearly not enough. Hanging the tools on the pegboard will look neat as opposed to having them scattered all over the place. You can spice up the final look by painting the pegboards with a color of your choice. Bulky items that you can’t hang can be neatly arranged in cabinets. If you can’t build them, you can use wooden crates as custom cabinets. They are strong, durable and can hold heavy materials. You can add some flower pots in the empty spaces to add an overall decorative look. So, as I mentioned in the beginning, sheds are no longer just storage areas. In fact, I would bet you that it is easier to find Wi-Fi access in a shed than it would be to find a wheelbarrow. People have re-purposed their sheds and are now using them for work or hobbies. The following are some of the ways you can re-purpose and decorate your shed. Do you love reading? You can turn your shed into a refreshing retreat where you can sit back and enjoy your favorite books. It doesn’t need to be anything big. Squeeze in one or two shelves and a comfy chair, and you will be good to go. But if moderation is not your cup of tea, nothing is stopping you from creating space for additional shelving to accommodate your enormous volume of books. Working from home can be hard with so many distractions around. Noisy kids are running around everywhere and the blaring TV is very hard to ignore. A garden office will give you with all the peace you require to focus and concentrate on your work. You can bring in a wooden desk for your computer and other gadgets and a classic, comfortable work chair. That’s all you need to transform your shed into a private office. If making the shed an office kept you away from the noisy kids—whom you still love, this one will keep them away from the house and keep it mess free. Decorate your shed with your children in mind. Kids love bright colors; use this to paint the walls. Fill the space with their favorite toys and all the fun stuff that they love—you know them best. Teenagers are not exempted. Add in a pool table, their favorite musical instruments and install a sound system. Install soundproof walls if you’re worried that the noise might distract you. The kids will have their fun, and you will have all the leisure time to yourself. Everybody wins! I saved this point for last because everything you do should ultimately be directed at achieving this single purpose: The shed should be a reflection of who you are. It is your personal space after all. Every feature you choose to include, the furniture you decide to use, the color palette you go for and every decoration you choose to add should please you most of all. Even when your hobbies and preferences change, as they will, the shed should reflect this change. When it comes to decorating your shed, there are no rules. What I offered are simply suggestions, and you should pick what works for you and also feel free to come up with your own unique ideas. Remember that creativity will take you far and that no idea is a bad idea. Ultimately, the best shed is the one that reflects who you are.